I AM A big fan of (and perhaps a little obsessed with) beetroot. I think if I had to pick a favourite veg to grow, beetroot would come out on top (with a little competition perhaps from squashes, leeks, carrots, tomatoes, garlic, …oh sod it). Beetroot, why do I love thee? Let me count the ways. First of all it’s easy to grow – it is rarely troubled by pests or disease and grown in module trays for later transplanting, I find it almost 100% reliable. Let’s be honest, there aren’t many veg you can say that about. Secondly it’s great value for space – because the beetroot are sown quite close together, you will get 40 beetroot from just a metre of veg bed (in four rows, with the beets 10cm apart in each row). 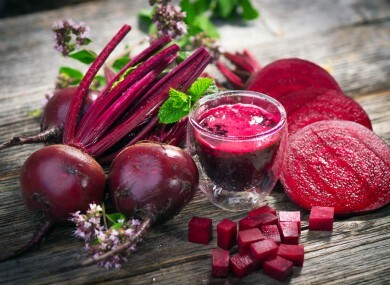 Thirdly, beetroot is incredibly good for you – the beta cyanin in beetroot can help detox your liver and reduce high blood pressure. It is packed with nutrients like folic acid, phosphorous and magnesium and is particularly high in vitamin C and iron – this is a great combination since vitamin C increases iron absorption. Finally, and perhaps most significantly, beetroot stores really well, making it possible to become self-sufficient in this superfood all year round. I generally do three sowings of beetroot each year to maintain a consistent stash – an early crop sown in February for the polytunnel, a second crop sown around mid-April for the summer months, and then a final ‘storage’ crop sown in July for lifting in October. I store beetroot in a box of sand in the shed from which we can enjoy fresh beetroot from October until May. Eating three a week on average we chomp through about 100 beetroot in this time. This week I sowed a tray of beetroot in the potting shed, though of course you can sow them direct in the soil if you wish (see ‘things to do this week’ below). I sowed a full 84-cell module tray with one seed per cell and a selection of varieties (Detroit Globe, Pablo F1, Bulls Blood, Chiogga Pink and Laura Anne). All of these varieties are available from the GIY webshop, bar Laura Anne which is available from Brown Envelope Seeds. Beetroot likes a deep, sandy soil, manured the previous winter. Apply organic fertiliser about a week before sowing. Germination is in about 10 days and you will have roots to eat in about three months. Sow either in module trays (for careful transplanting about a month after sowing) or in situ outside about 1 inch deep, 4 inches apart in rows about 12 inches apart. Traditionally two seeds are sown at each point and then one is taken away when the seedlings are 1 inch high. Bear in mind that a beetroot seed is actually a “cluster” of up to five seeds, so you may need to thin out if they all germinate. Sow every two weeks from April until July (for a continuous supply of young beets) although you can start even earlier (February) in a greenhouse or polytunnel. Sow another batch in July for winter storage. If you have a good supply of fresh chard, then this curry should be pretty seasonal with all other ingredients generally available in the store cupboard. This recipe is from River Cottage Every Day. Separate the chard leaves from the stalks. Cut the stalks into 2–3cm pieces and roughly chop the leaves. Heat the oil in a large saucepan over a medium heat, add the onion and fry until just golden. Meanwhile, pound the garlic, chilli and ginger together with a pinch of salt to a paste. Add to the onion and cook, stirring, for a couple of minutes. Tip in the rest of the spices and stir for a minute or two. Add the potatoes and chopped chard stalks and fry, stirring frequently, for 5 minutes, so that they are well coated with the spice mixture. Pour in about 400ml water – enough to just cover the veg. Bring to a simmer, cover and cook for 10–12 minutes until the potatoes are just tender. Add the chard leaves, stir and cook until just wilted. In a bowl, whisk together the yoghurt, tomato puree and some of the hot liquid from the curry. Remove the curry from the heat, stir in the yoghurt mixture, return to the heat and warm through very gently (if it gets too hot, the yoghurt will curdle). Stir in most of the coriander. Taste and add salt and pepper if needed. Scatter over the toasted nuts and remaining coriander, then serve with rice and naan bread. Start to harvest when they are golf ball size – leaving every second one behind to fully mature. Do not let beets grow larger than a tennis ball. You can also harvest some of the leaves for salads, but not too many as the root needs the leaves too. Twist off leaves a few centimetres above root before storing. Handle carefully – they will “bleed” if damaged. Wrap 8-10 small beetroot in tinfoil (leave the skins on) and bake them in a hot oven for 30-45 minutes. When they are tender, run them under a cold tap and simply rub off the skins. Sprinkle with some balsamic vinegar and eat immediately – a revelation! Email “Beautiful Beetroot: delicious, nutritious and (most importantly) easy to grow”. Feedback on “Beautiful Beetroot: delicious, nutritious and (most importantly) easy to grow”.